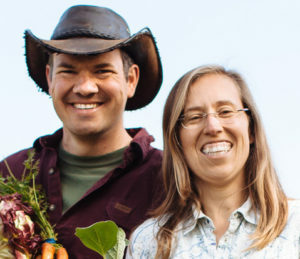 At Singing Frogs Farm, Elizabeth and Paul have applied their unique backgrounds in farming, nutrition, public health and agroforestry to develop a highly intensive, no-till, ecological management system for their small but mighty vegetable farm and CSA. Learn how to adopt their techniques to bring tremendous benefit to your farm or garden’s soil, increasing yield and improving the natural ecology. The Kaisers grow over 100 different crops year-round on three acres, a third of which goes to their 130 member CSA and two-thirds to various farmers’ markets, restaurants and a local food hub. The Kaisers method of farming has resulted in an increase of over 300% in their soil organic matter, while drastically reducing their water use, and generates over $100,000 per acre in sales. 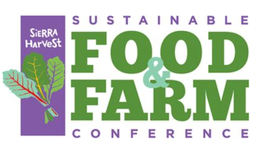 Come to the 2018 Sustainable Food & Farm Conference to learn first-hand how you can decrease your fertility inputs, decrease your water useage and maximize your crop yields while improving the ecological health of your land. Elizabeth and Paul have received five awards for their innovative, ecological farming practices. For the past few years, they have focused on promoting successful small scale, organic, no-till vegetable production and agroecology. Elizabeth and Paul met in Peace Corps in Gambia, West Africa where Elizabeth first worked to support farmers in areas of nutrition, health and self-sufficiency, and Paul worked in tropical agroforestry to convert degraded lands into economically viable and biologically diverse and resilient farmland. Since then, Elizabeth received dual Masters Degrees in the Public Health field and worked with immigrant farmer families at the Sonoma County Department of Public Health for 9 years. The love of farming overcame her love of public health and she is currently a full-time farmer. At the same time, Paul received dual Masters Degrees in Natural Resources Management and Sustainable Development. They have been farming at Singing Frogs Farm together since 2007.